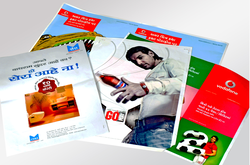 Keeping track with latest market development, we are devotedly engaged in manufacturing a wide assortment of Advertising Leaflet. We are engaged in offering high quality Leaflet to our customer. All pharma product leaflet will print, As soon as other product booklet, uv print also printing. To manufacture an appealing and attractive range of Memo Leaflets. we are using high quality colored paper of 80 g/m² weight. These promotional products are available in various printing, sizes and specifications to meet the demands of our customers. The Memo-Leaflets are supplied on rolls for automatic application with both one-sided and two-sided printing. 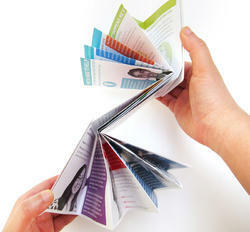 Leaflets have become an important marketing element in the beauty care segment. As one of Germany's leading leaflet manufacturers, Edelmann is able to offer a wide range of different leaflets.